This last week since we have been home from Oregon has been very eventful. The day after we got home, we went to Grammy and Papa's to swim. To make a long story short, Brady fell off the couch outside on the porch. He was strapped into a portable high chair (I know you are not suppose to do that). I left him on the couch to take Peyton to get his bathing suit on. As I was walking away from him I thought, that their is no way that he can flip out of it. I didn't even make to back door and I turn around and he was on the ground. I ran to get him and we immediately took him to the ER. He was crying, but not as much as I would think that he should have been. His eyes were rolling back in his head. I was freaking out (you can ask my mom). Once we got him to the ER he was starting to perk back up. I thought for a second that we could take him home, that he was fine. I was also thinking better be safe than sorry. They did a CAT scan just to check to make sure that their was no blood clot. Everything came back fine thankfully. We had to watch him closely for 24 hours and he had to sleep with us that night. 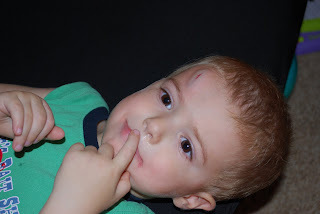 Okay, so that was one head injury. On Monday of this week, Peyton was running down the hall away from Addy at my sister's house. He was not watching where he was going and he of course hit the wall. He did not just hit the wall, he hit the door henge with his forehead. Oh, did he ever get a bump. It is all bruised and looks horrible. He is fine though. 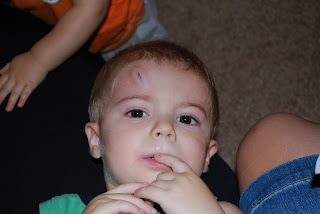 I guess that I am going to have to get use to head injuries with 2 boys. Here is a picture of Peyton's injury. I did not even think to take a picture of Brady's. Peyton's injury looks much worse than Brady's did surprisingly! We are just thankful that neither injury turned out serious. 2 weeks ago we flew to visit Dwayne's family in Oregon. We had a really good time. Peyton had a blast playing with his cousins Elyse and Luke. The weather was cool for us. I had to pull out jeans and jackets from the storage. We stayed with Grandpa and Grandma for a few nights and then got to stay with Uncle Ben and Aunt Randie and few nights too. Peyton had fun playing with all of their toys. It was fun visiting family. The 4 hour flight was interesting on the way there. We have found out that Peyton gets motion sick on the way down. He was complaining that his ears hurt and his stomach. Yes, you can image what happened soon after. It was a mess! He felt fine once we got off the plane. I was not looking forward to getting back on the plane 4 days later. On the way home we gave him motion sick medicine and he did fine. We were very thankful.